Travel can be expensive, but a good travel credit card can help offset the cost — or help you travel for free — by rewarding you points or miles for making everyday purchases. 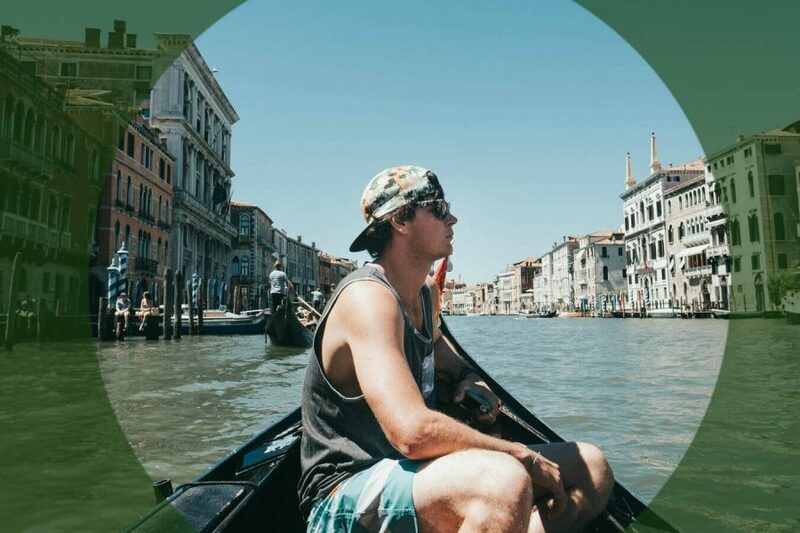 In addition to earning points that can be redeemed for everything from flight tickets and hotel stays to cruises, vacation packages and more, most travel cards also offer side perks including access to VIP airport lounges, spending bonus offers and travel insurance that can further help you save on travel. To help you decode the ins and outs of travel rewards programs, we’ve rounded up the best travel credit cards in Canada for 2019. 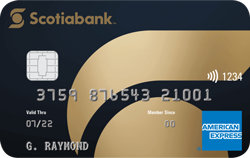 The Scotiabank Gold American Express continues its run as one of the best travel cards in Canada due to its high earn rate and flexible travel options. With this card, you’ll get four Scotia Rewards points for every $1 you spend on gas, groceries, restaurants and entertainment, and one point per dollar on all other purchases. For new accounts opened by June 30, 2019, you can earn 15,000 bonus points when you make $1,000 in everyday purchases in the first three months. When redeemed for travel, 100 Scotia Rewards points = $1. This includes flights, hotels, car rentals, cruises, and vacation packages. The card’s annual fee is $99. In addition to its rich rewards structure, which gives you 4X the points in four different spending categories, points earned on the Scotiabank Gold American Express are flexible. 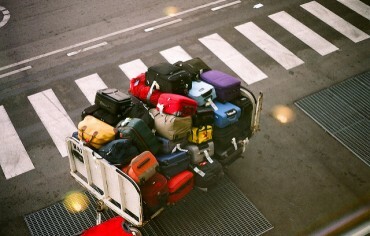 There are no restrictions on travel dates or airlines, and points can be used to cover taxes and fees. You can choose to book your travel through Scotia’s full-service agency or on your own and use points to cover the cost. The 15,000 point welcome bonus can also help you fast-track your travel plans. Book your trip on this card and you’ll be covered up to $1 million for travel medical emergencies for 25 days. This card also features travel accident insurance of $500,000, rental car damage and collision insurance, hotel burglary coverage and baggage delay insurance of $1,000 per trip that comes into effect after only 4 hours (read the card’s full insurance details here). The card offers a 30% discount on a yearly Priority Pass membership, which grants you access to VIP airport lounges in more than 100 countries worldwide. The discounted annual membership price is USD$65, and each lounge visit costs USD$27. Scotiabank Gold American Express cardholders also have access to 24/7 concierge services. 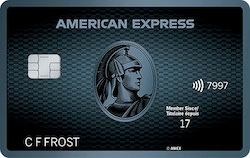 The American Express Cobalt Card is another travel rewards card that continues to impress in 2019 for its inclusive spending categories. Tailored for foodies, travellers and commuters, this card earns you five Membership Rewards points for every $1 you spend on “eats and drinks” (groceries, restaurants, bars, cafes, and food deliveries), two points for every $1 on “travel and transit” (airfare, gas, taxis, Uber, hotels and public transportation), and one point per $1 on all your other purchases. When redeemed for travel, 100 Membership Rewards points = $1. The card’s generous rewards structure nets you one of the highest returns on food purchases (the equivalent of 5% back in travel rewards) as well as double the points on a range of travel and commuter costs (from flight tickets to taxis). The welcome offer is another of the card’s stand-out features, as you can earn 2,500 bonus points each month you spend at least $500 during your first year (up to 30,000 points / $300 value). The Cobalt’s $120 annual fee is also easier to manage as its charged at a monthly rate of $10 rather than all at once. Lastly, points can be used to cover taxes and fees and can be redeemed retroactively – so you can book your trip first and apply your points to cover the cost later (up to one year after your purchase via phone and three months via web). The card includes a full suite of travel insurance benefits, including travel emergency medical ($5,000,000 for 15 days) and travel accident insurance ($250,000), flight delay ($500) and baggage loss / delay ($500 per trip). The Cobalt’s car rental insurance covers collision, loss and damage for vehicles with an MSRP of up to $85,000. American Express Cobalt cardholders get access to special offers including ticket pre-sales and reserved seats for concerts, movies and culinary events through American Express Invites, as well as 24/7 concierge services. The TD First Class Travel Visa Infinite is arguably the frequent traveller’s credit card, thanks in no small part to its flexible airline options and high return on travel spending. 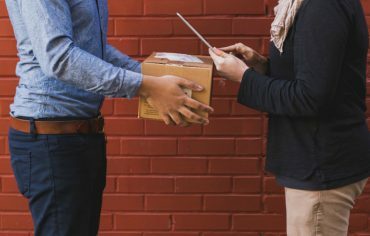 Through TD’s and Expedia’s co-branded website (ExpediaforTD.com) cardholders can earn and redeem points for flights from hundreds of airlines as well as hotels and other travel-related expenses, such as car rentals and all-inclusive vacations. For all purchases made through ExpediaforTD, this card will earn you 9 TD points per dollar. 1 TD Point = $0.005, so that adds up to 4.5% on almost all travel spending. For all other purchases, this card offers 3 TD points per dollar. 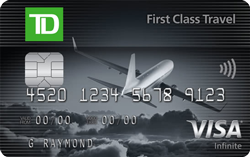 The TD First Class Travel Visa Infinite also provides new cardholders with a first year annual fee waiver and a bonus of 20,000 TD points after their first purchase along with an additional 60,000 TD points once $1,000 is spent on the card in the first three months. First and foremost: the welcome offer. The 80,000 TD point bonus combined with the annual fee waiver means new cardholders can get up to $520 in added value in the first year alone – and that’s not counting points earned on everyday spending. This card also offers one of the richest rewards rates for travel spending, with a return of 4.5% per dollar on any purchase made on ExpediaforTD. That’s more than double the rewards rate on travel spending offered by most of the other cards on this list and considerable bang for your buck if you’re a frequent flyer who spends big on flights. With the TD First Class Travel Visa Infinite, you’ll also have flexibility on your side as this card offers access to Expedia’s complete inventory of airlines and hotels. That means you won’t have to worry about black-out dates or seat restrictions. Lastly, with the ability to redeem rewards from increments of only 200 points, you won’t have to rack up thousands of points for them to be put to good use. This card includes up to $1,000,000 in travel medical insurance for 21 consecutive days (or 4 days for seniors), trip cancellation coverage of $1,500 per person and $1,000 in lost or delayed baggage insurance. You’ll also get the standard auto collision and loss damage waiver for rental cars for a period of up to 48 consecutive days. Cardholders can get up to 10% off car rentals from select Avis and Budget locations and an annual discount to Priority Pass Memberships. 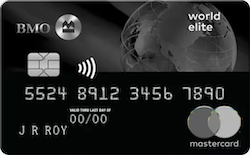 The BMO World Elite MasterCard is a popular card for frequent travellers who tend to spend big on going out and airfare. With this card, you’ll earn three BMO Rewards points per dollar on travel, restaurant and entertainment purchases, and two points per dollar on everything else. If you spend $3,000 on the card within the first three months, you can earn 35,000 bonus points ($250 value). Points can be redeemed for flights, hotels, vacation packages and car rentals. The card’s annual fee is $150, which is waived for new cardholders for the first year. This card is big on perks and flexibility and offers the ability to redeem points for flights on any airline with no blackout dates (points can also be used to cover taxes and fees). Not to mention, the BMO World Elite Mastercard currently boasts one of the strongest welcome offers of any travel credit card in Canada with a first year annual fee waiver and 35,000 bonus points (potential combined value of $400). The card includes coverage under World Elite travel insurance, which offers $2 million in travel emergency medical (for up to 21 days, ages 65 and under) and $500,000 in travel accident insurance. The card comes with an annual MasterCard Airport Experiences membership (plus four free passes per year), which gives you access to VIP airport lounges around the world ($140 in added value). The Home Trust Preferred Visa isn’t a travel credit card, per say, but it offers travellers a major benefit most credit cards lack: 0% foreign transaction fees. This means if you make a purchase in a currency other than the Canadian dollar, it doesn’t charge you any additional fees (most cards tack on a fee of 2-3% of the purchase price). With this card, you’ll also earn 1% cash back on all purchases. Note that this card isn’t available to residents of Quebec and is limited to 10 transactions per day. It’s one of the few credit cards currently on the market in Canada with no foreign transaction fees. With no annual fee, this is a good card to keep in your wallet if you travel frequently or make a lot of purchases abroad in foreign currencies. There’s also no limit on the amount of cash back you can earn on the card. 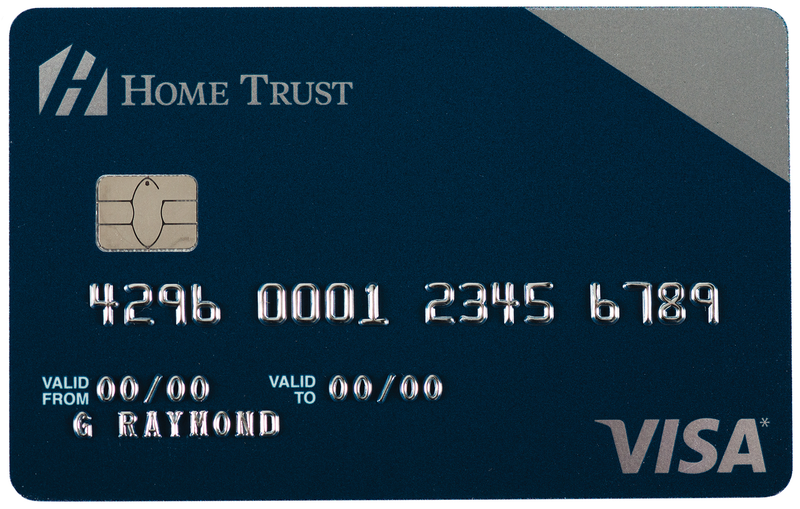 As a no annual fee card, the Home Trust Preferred Visa doesn’t boast as comprehensive of an insurance package as the other cards on this list. With that being said, it does offer rental car collision and loss damage provided by Royal Sun & Alliance Company of Canada. The Home Trust Preferred Visa is among the handful of credit cards with free roadside assistance. 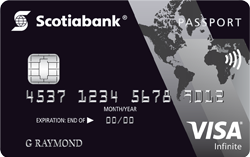 The Scotiabank Passport Visa Infinite is another credit card that doesn’t charge a foreign transaction fee — currently the only card from one of Canada’s Big Six banks to do so. With this card, you’ll earn two Scotia Rewards points for every $1 spent on groceries, dining, entertainment (including movies, concert tickets, musicals, plays and orchestras), and transit (including buses, subways, taxis, limos, trains and ferries). For all other purchases, you’ll earn one point per dollar. The card’s annual fee is $139. The 0% foreign transaction fee is the icing on the cake of a card rich with perks, spending bonuses and flexibility. If you spend $1,000 on the card in the first three months, you can earn 30,000 bonus points (value: $300). The card includes a Priority Pass membership and six free visits annually to VIP airport lounges worldwide. You can redeem points for flights on any carrier with no date restrictions and book your trip through Scotia’s full-service travel agency or on your own. This card offers the same suite of travel insurance benefits as the aforementioned Scotiabank Gold American Express – including travel emergency medical and accident coverage, trip cancellation and interruption, flight delay, baggage loss, car rental collision/loss damage waiver and more (read full insurance details here). If you make at least $40,000 in purchases annually on the card, you’ll earn an additional 10,000 Scotia Rewards points. You also receive six complementary passes to Priority Pass airport lounges. The MBNA Rewards Platinum Plus® Mastercard® is a no-fee travel card that gives you two points for every $1 spent on eligible gas, grocery and restaurant purchases (up to $5,000 annually per each category), and one point per dollar on everything else. The card has no annual fee, but still offers flexibility and the ability to earn bonus points in three different spending categories. Plus, cardholders can earn a welcome bonus of 2,500 points (value: $25) after making their first purchase, and/or 2,500 points for signing up for online e-statements within their first 90 days. There are no blackout dates on travel, and points can be used to cover taxes and fees. Even with no annual fee, the card comes with a strong insurance package that includes travel accident coverage ($1,000,000), car rental collision/loss damage waiver and trip cancellation insurance ($2,000) in instances when an immediate relative passes away and you have to travel back home. Another option with no annual fee is the Blue Sky Credit Card, with offers a flat rate of 1.25 Blue Sky points on all purchases. Every 100 points = $1 when redeemed for travel, and points can be redeemed starting at 10,000 points (value: $100 in travel) in increments of 5,000. When you use the card to book travel, you can book the trip first and apply your points to cover the cost up to one year after the purchase. As a new cardholder, you’ll also receive 10,000 points when you spend at least $500 on the card in your first three months. 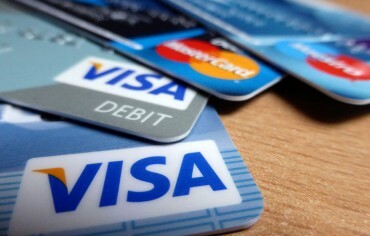 In addition to the fact the Blue Sky Credit Card offers one of the largest welcome bonuses for a no fee credit card in Canada, it also provides many of the same basic benefits as cards that do charge annual fees – such as no blackout dates and travel that can be booked through any carrier or travel agency. The flat earn rate makes it easy to understand and track exactly how many points you earn with each purchase. The card includes up to $100,000 in travel accident insurance. Optional top-up coverage can be added to the card. 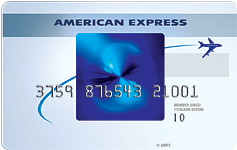 Cardholders get access to special offers including ticket pre-sales and reserved seats for concerts, movies and culinary events through American Express Invites. 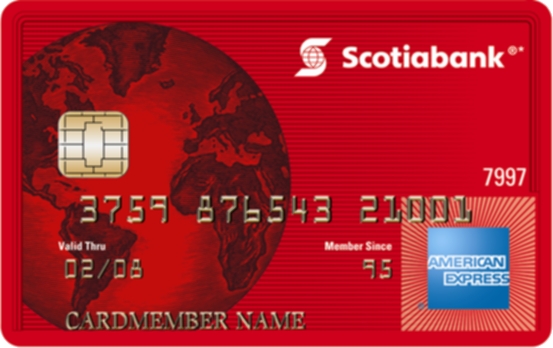 The Scotiabank American Express Card has no annual fee and offers a flat rate of one Scotia Rewards point per dollar on all purchases. As an additional benefit, new cardholders who open an account by June 30, 2019 are also eligible to earn 5,000 bonus points after making $500 in purchases on the card within the first three months – which equates to $50 in free in travel rewards. It’s a straight-forward no annual fee rewards credit card with excellent travel coverage and flexible points that can be redeemed for flights on any airline with no black out date or seat restrictions. Travellers are insured with $1,000,000 in emergency medical insurance for eight consecutive days, $250,000 in travel accident insurance, trip interruption coverage and car rental collision/loss damage. Cardholders can take advantage of a special 25% discount off of qualifying car rentals at participating Avis and Budget locations. For many frequent travellers, earning points that can be redeemed for discounted accommodation or a free nights stay at a hotel is just as (if not more) important as securing a deal on a flight ticket. 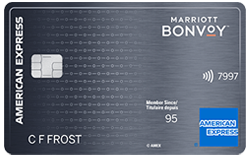 Enter the Marriott Bonvoy American Express Card. Relaunched in February following the merger of Starwood and Marriott, this card offers 5 points per dollar spent at any of the 6,500 hotels under the Marriott umbrella and 2 points per dollar on all other purchases. Points can be redeemed for free nights at any of those same 6,500 hotels, which includes brands such as Starwood Hotels and Resorts, Ritz Carlton, Sheraton, Delta and over a dozen others. This card also features a large welcome bonus of 60,000 points after spending your first $1,500. This credit card gives one of the highest returns on hotel bookings at 5 points per dollar, with points that can be redeemed at over 6,500 hotels world-wide. If you hit the welcome offer spending threshold, you’ll also earn enough free points to book up to four free night stays at select hotels. Another added plus of this card is its wide array of point transfer options. You can convert Bonvoy points to the loyalty programs of over 40 airlines. With a Marriott Bonvoy American Express Card, you’ll receive a free hotel stay each year on your cardholder anniversary. You’ll also automatically be enrolled into Bonvoy Silver Elite status, which offers a number of perks including priority late checkouts and discounts on bookings and gift store purchases at participating hotels. The Three Best Investment Tips I got my G1 license, what now?